Hero Cats Will Save The Day! Wherever I go I’m always on the lookout for new, unique & fun cat themed items to feature on my website or write about on my cat blog. On my recent adventure at CatConLA 2016 I discovered something brand new for me- Hero Cats of Stellar City comic books! Let me introduce you to the pack! Each one has a special talent for fighting crime and aliens and when you read the comics, you’ll also learn about their own special stories that brought them to where they are today. Ace is the team’s ever brave leader. Cassiopeia is the recent addition to the team. She is a truly clever tabby cat who is able to read human writing. Rocket is the fastest cat in the world and might be from outer space. Belle can read the human mind. There’s no fooling this feline. Midnight has a passionate dislike of criminals and is able to jump to extraordinary heights. Rocco is the mountain of muscle who never loses a fight. His heart is big and true. Bandit is ever the charmer and is skilled at covert operations. The comic is told by Cassiopeia, the smart orange tabby, as she joins the team and soon proves her value to their mission. The books are written by Kyle Puttkammer who was in attendance at the show so I was able to get an autographed copy of my purchase. The fantastic artwork is a collaboration of Marcus Williams, Ryan Sellers, Omaka Schultz and Briana Higgins and the comic is published by Action Lab Entertainment. The team has worked on other comics, including a spin off of the adventures of Midnight Cat. I fell in love with the cast of Hero Cat characters and found myself rooting for them during their daring escapades. This is such a fun book to escape into for a fantasy of a world where cats have super powers. Being a new reader, I bought Volumn 1 which includes the first three issues of the comic books. I plan to add to my collection and hopefully own them all! This entry was posted on Sunday, August 14th, 2016 at 4:58 pm and is filed under Animal Books, Cat Art, Cat Artists, Cat Comic Books, Cat Humor, CatConLA, Orange Tabbies. You can follow any responses to this entry through the RSS 2.0 feed. You can leave a response, or trackback from your own site. Georgia's Gifts has unique, whimsical gifts and decor for cat lovers. 9 Fun & Colorful Summertime Gift Ideas for Cat Lovers! + Bonus Buy! 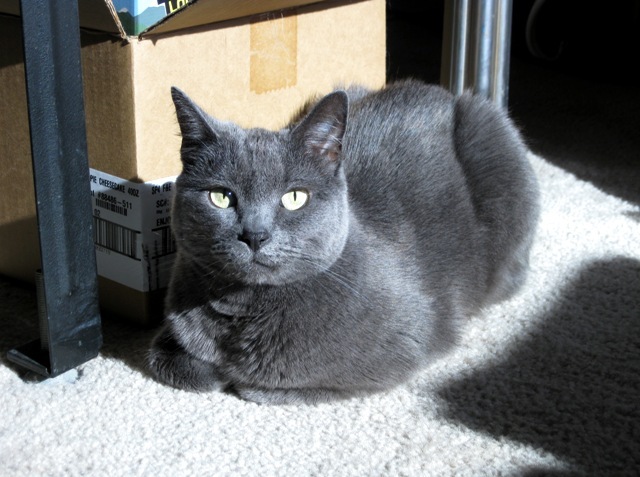 Our sweet Russian Blue cat, Dessa.